The Harmony app, Harmony Ultimate Home, Ultimate, Ultimate One and Touch remotes allow you to control your devices using swipe gestures, allowing you to send commands with ease. For example, you can double tap your screen to bring up your set top box TV guide, swipe up, down, left or right to navigate through the show listings, then long press to tune to a station. 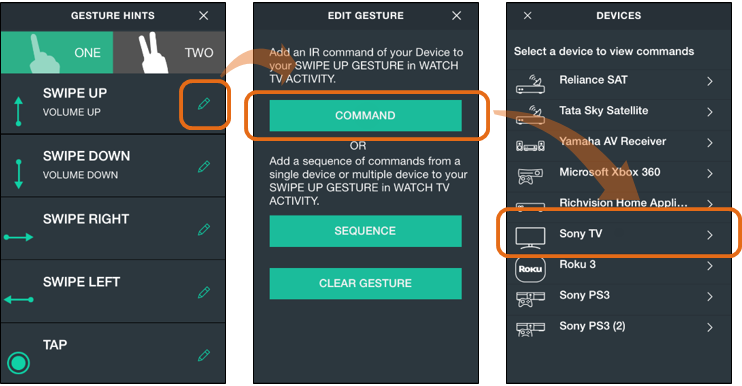 Once an Activity has started, select the hand icon to enter gesture mode. To review what each of the swipe actions do, press the ( i ) information icon in the lower right corner of the gesture screen. 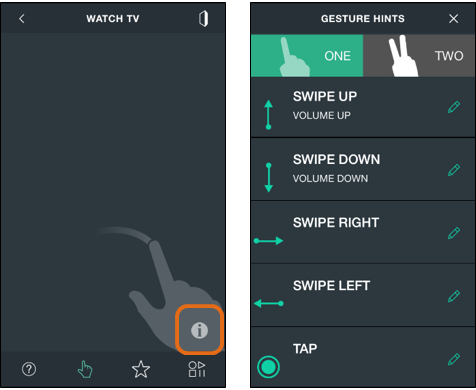 Toggle between the ONE and TWO finger views to see all 22 gesture actions. A single IR command to any device used within this Activity. Sequences must first be created using the MyHarmony desktop software. Learn more about creating button sequences (macros). Select the Activity for which you'd like to restore gestures. If no customizations have been made, there will not be any Activities listed. On Harmony Ultimate Home, Ultimate, Ultimate One and Touch remotes, once an Activity has started, an up arrow will appear in the bottom part of your screen. 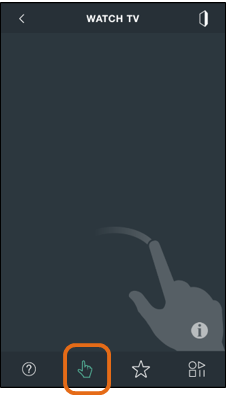 Click or swipe up on the arrow to reveal the gesture mode, navigate by swiping or tapping within the middle part of your screen, and click or swipe down on the top arrow to exit gesture mode. To review what each of the swipe actions do, press the ( i ) information icon in the upper right corner of the gesture screen.